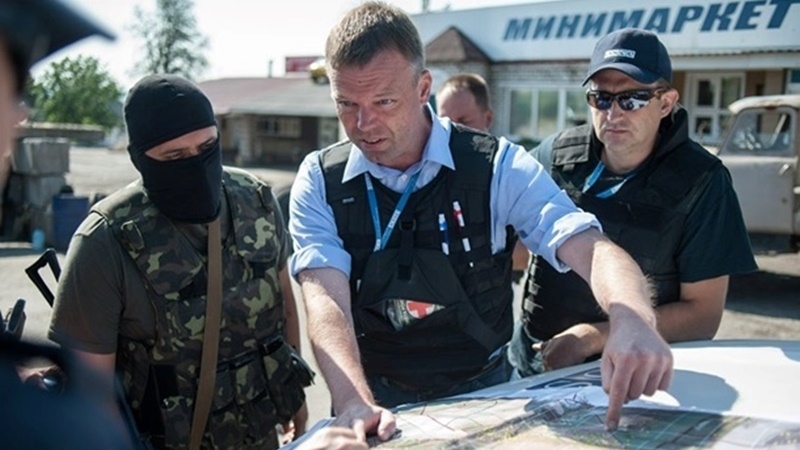 Instead of withdrawal of the prohibited weapons, the militants attempt to disguise it and hide it from international observers. The militants of the so-called DPR are placing prohibited weapons in the residential areas of the Trudivsky in the city of Donetsk and at the same time using various methods to conceal it from the OSCE SMM as well as the facts of violation of the Minsk agreements. According to QHA correspondent, at a briefing in the UCMC, the Principal Deputy Chief Monitor of the OSCE Special Monitoring Mission to Ukraine Alexander Hug told how militants installed a mortar near the residential quarters, and when they saw the UAV mission, they tried to hide it quickly, which is evidenced by photo-materials. Alexander Hug stressed that the presence of such weapons in close proximity to residential buildings puts civilians in grave danger - in case of firing, a mortar from the opposite side is likely to return fire. Mortars and artillery, which are often used in this conflict, are indirect means of defeating and the nature of their use is not targeted. Despite the fact that civilians are not necessarily direct targets, they are often affected, the Principal Deputy Chief Monitor of the SMM noted. He said that only on May 6 three people were killed in the Trudivsky district and 20 people were injured. According to Alexander Hug, it is significant that instead of withdrawal the weapons to the distance determined by the Minsk agreements, the militants of the so-called People's Democratic Republic are trying to just conceal their violations. He demonstrated two photographs on which the mission’s drone captured the mentioned mortar at the firing position, and in just a few minutes the same mortar was covered with some kind of cloth to hide it from the UAV. In the report of July 29, the SMM noted that this mortar (probably PM-38, 120 mm) was in the northern part of the microdistrict facing north-west direction. Speaking about the situation in the microdistrict Trudivsky, Alexander Hug also said that the "DNR" militants are trying to hide the facts of violation of the Minsk agreements by other methods. In particular, not allowing patrols of the mission or shelling its UAV. Thus, since May 6, SMM patrols in this region have encountered obstructions on the part of the so-called DPR 10 times. And on July 20, in the microdistrict Trudivsky, the SMM drone was fired 17 times from small-arms . Principal Deputy Chief Monitor of the OSCE Special Monitoring Mission to Ukraine noted that both sides - the Armed Forces of Ukraine and the militants of the "LPR-DPR" - refuse to withdraw certain types of weapons. After the car was blown up in Prishib, SMM patrols are still operating in restricted mode for security reasons. Patrolling only hard-surfaced roads affects the volume of information in the mission's reports, which in recent weeks have significantly less data on violations of the lines of diversion in the territory beyond the control of the government of Ukraine. Alexander Рug also said that the number of casualties among civilians increases weekly on both sides of the ATOline. So, according to the latest data, since the beginning of this year the number of of such victims confirmed by SMM is 341 people - 59 dead and 282 injured. Earlier, on July 26, the OSCE SMM revealed one unit of towed artillery (of an unidentified type) in the northern part of the Trudivsky microdistrict, deployed in violation of withdrawal line, in close proximity to housing arrays, as well as eight military-type trucks, and a section, probably with firing positions, located in the western part of the microdistrict. It is worth noting that the Trudoivsky microdistrict, which is located in the western part of Donetsk, is considered dangerous. Militants systematically accuse the AFU of bombardment of the microdistrict. 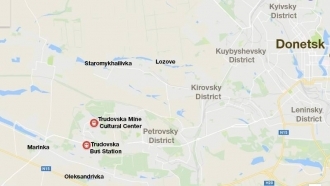 At the same time, the headquarters of the ATO states that the militants place weapons in Trudivsky, from where they shell the residential areas of settlements on the territory controlled by the government through the contact line. So, according to the information of the ATO headquarters, on July 12, Marinka was fired from the large-caliber machine gun,that the militants located in the Trudivsky area.